"If it wasn't for the Extratech kit, this one might not seem so bad. Mach 2 seem to have made some improvement with their work since the HUP kit (#012), but in this case it is definitely too little, too late, at way too high a price. First of all, the answer to everyone's question is...yes, the tailboom lattice is plastic. I must admit that they have made a good effort with the plastic parts, as the mouldings are only about 25% thicker than those in Italeri's H-13 kits. Unfortunately, the mouldings are coarse, with a fair amount of flash and relatively thick moulding gates. The surfaces of most large parts are not perfectly smooth, and there are several places where parts have been damaged when the trees were ejected/removed from the moulds. The canopy bubble is two parts, left and right halves, and while it is still as thick as the canopy for their HUP, in this case it is a good bit clearer. It will still need polishing, but is not a total write-off. "Positive points for this kit are that it does seem to check out dimensionally speaking; the options for wheel, skid, and float undercarriage; ALAT or Aeronavale markings, and pretty box-art (HKN #91)." 2. 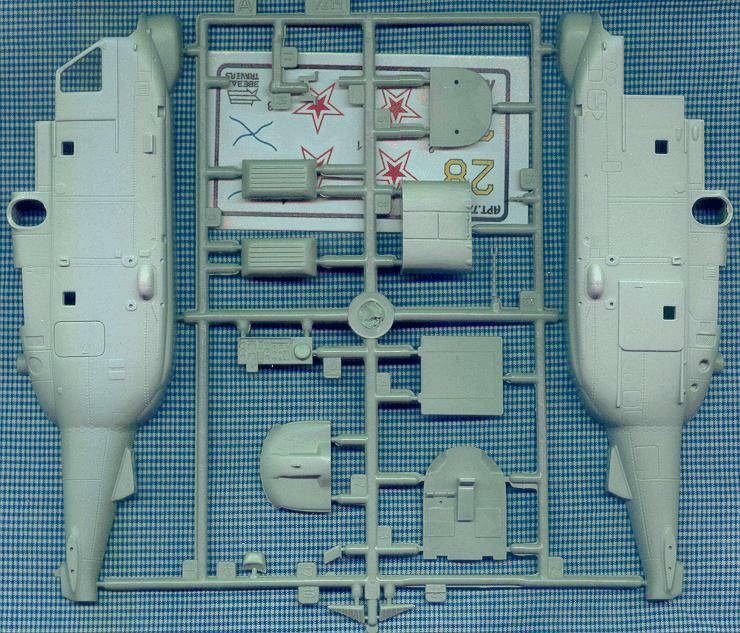 The Zvezda 1:72 Kamov Ka-27 kit #7214 shares many features with the earlier Zvezda (#7221) and Italeri (#076) Ka-29. 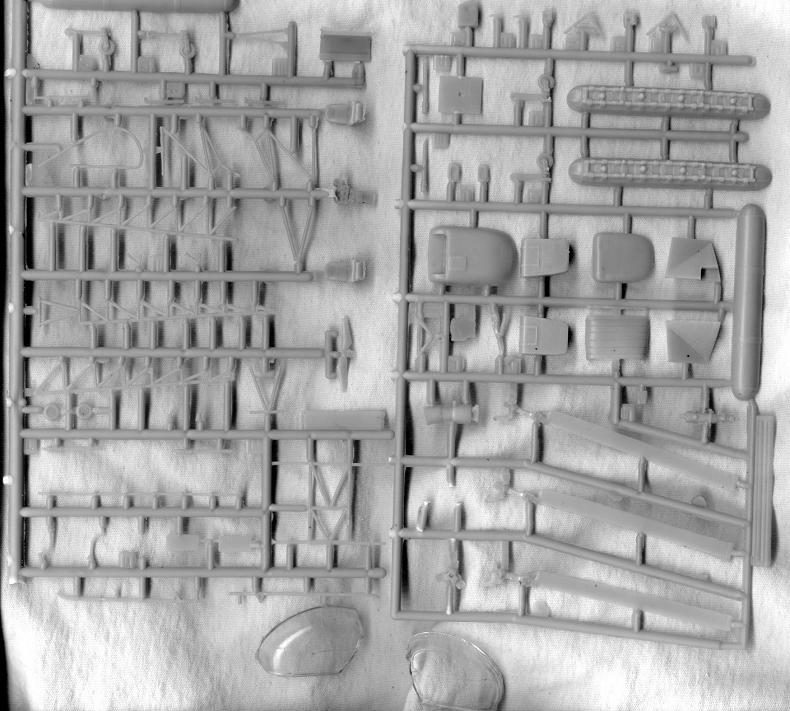 The sprue which carries the rotors and most of the detail parts is identical, but the fuselage and clear sprues are entirely new. The most pleasing aspect of the new fuselage pieces is that Zvezda have removed most of the excessive rivet detail, leaving just a few fine lines of rivets and nicely engraved panel lines. This looks like a nice kit, although the decal sheet can be described as minimalist at best. 3. The Turntable (Halifax, UK) have the Miku Robinson R-44 kits #72047 & #72065 in stock. They also have another boxing of the Mi-8 from KP, this time #K-72 in German 'SAR Meet 1991' markings, and the Extratech Alouette (but not the Lama, yet). Tel: (44) 1422-883489. 4. Twobobs Aviation Graphics are an aftermarket decal company that is putting together a 1:48 decal sheet for the AH-1S Cobra. They are going to concentrate on foreign user schemes and are looking for reference material. Any help would be greatly appreciated. They plan on releasing a 1:48 USAF Special Ops sheet as well. They say "Each sheet will have full stenciling data. In many cases, enought stenciling data to build 2 0r 3 aircraft. Our instruction sheets will be full-color "magazine-quality" prints on thick 80 lb. stock. We put as much work into our instruction sheets as our decal sheets. We realize many of you use your decal instruction sheet as a main source of reference material." German Army (Test Centre) with FLIR on nose. Also, details and scale drawings of the A.109, especially rear engine, undercarriage, cockpit and underside details. They are looking at a conversion set for the Revell A.109 to make it into the British Army and Belgium Army versions. South African Helicopters; BK-117, Alouette III, and Puma/Oryx. 6. Yet more help wanted: I have been asked by a manufacturer to conduct a survey among the readers of HKN to find out what decals, conversions, or accessories you would most like to see produced. Over to you. Thanks to Tony Morgan, Yevgeny Borissov, and Keith Goodman.